Especially when it's between members of the same religion, and even more so when one of the outraged is none other than full-tilt douchebag William Donohue of the Catholic League. Placing statuettes of defecating people in Nativity scenes is a Christmastime tradition so old and so strong in Spain's Catalonia region that even the Roman Catholic Church here doesn't dare try to ban it. Spanish artist Antoni Miralda's exposition "Poetical Gut" at Copia, a food, wine and arts museum in Napa, Calif., features ceramic figurines of the pope, nuns and angels with their pants down, squatting over their bowel movements. The Catholic League for Religious and Civil Rights, a 350,000-member group based in New York, has written to the museum's board of trustees to say it finds the show offensive. "When it's degrading, everybody knows it except the spin doctors who run the museums," the group's president, William Donohue, said Sunday. Oh, Billy, you know I love it when you bring the stupid like this. It's great that the Catalonians are refusing to bend to this blowhard, this imbecile, this so-called protector of the faith who refuses to acknowledge that there just might be other Catholics in other parts of the world who have their own local traditions when it comes to their holy days and celebrations. Because while Donohue comes off as an ignoramus on most days, he really comes off as one here, considering that the tradition is one that dates back to the 18th century, and that the Barcelona Diocese considers it a harmless game for kids and plans to do nothing about it. You can see pictures of the figurines here, and the first one is of Barack Obama. 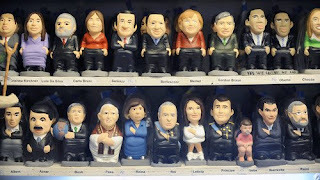 The tradition is that the figurines are Catalonian peasants in red caps, but this artist has done public figures. This is the last shot, a group one, but at the link there are 16 others, mostly of political figures and European sports stars.